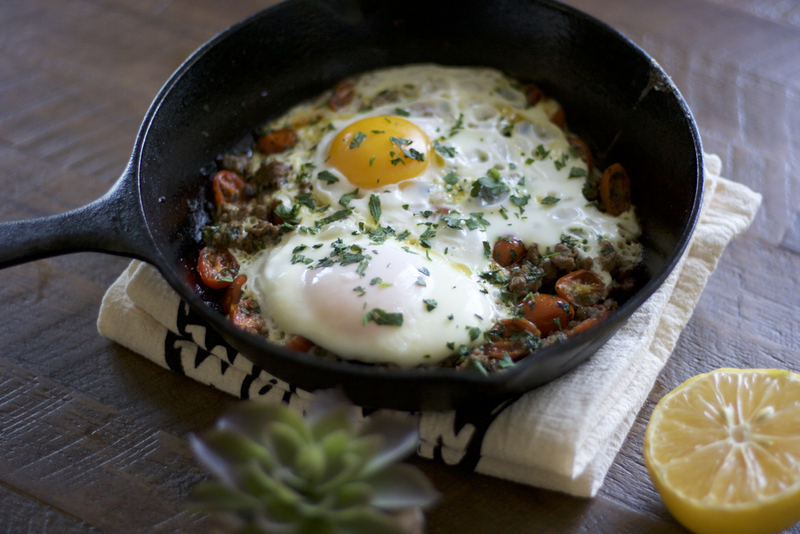 Makhlama is a dish of soft cooked eggs atop a skillet of ground beef with onions, parsley, tomatoes, and in my father’s style: the addition of lemon juice. Just trust me on this one. Using the best quality ingredients here will change the taste dramatically. 1. In a large skillet, heat about a tablespoon of olive oil at medium. Sweat the onions about 3-5 minutes. Add salt. 2. Add the ground beef. Be sure to break it apart as you stir so that the meat cooks in small pieces, like pebbles. Cook until browned at medium heat, about 5-8 minutes. 3. Once the meat is cooked, add the tomatoes and cook on medium heat 3-5 minutes. Then add parsley, lemon juice, salt and pepper to taste. Mix together well. 4. Bring the heat up to Medium/High, add the eggs on top of the mixture in individual spots. Top with some salt, preferably a nice flaky salt like Maldon sea salt. Immediately cover the skillet and reduce heat to Medium/Low. This shouldn’t take more than 5-10 minutes, depending on the density of your skillet. Keep checking, so that the whites are cooked but the yolks are still soft. 6. Once done, remove the cover. Top with more parsley! 7. Serve with samoon, khubz tanour, pita, or baguette! And if you’re like me, a little labneh, too! Variations of this dish are served from Africa, through the Middle East, all the way up to Norway! Labneh is a delicious middle eastern condiment also known as "yogurt cheese." Use leftover labneh in the morning by spreading it on toast and topping with jam. Make it Your Own: For a saucier version, add 1 cup water or broth and 2 TBS tomato paste before adding the eggs. For a richer version, spice the beef with cumin, paprika, chili powder, sesame seeds and/or harissa paste. For a garden fresh version, garnish with raw tomato wedges and/or raw bell pepper slices.